For the second time in the history of the Roccasecca Project, clergy, seminarians, religious and lay faithful gathered to celebrate the Purification of the Blessed Virgin Mary and to contemplate the role of light in the Christian life. The Church of Saint Mark made for a beautiful, hospitable setting once again. Of course, the premier means of contemplating the Light this evening was in the Holy Sacrifice of the Mass in the Extraordinary Form of the Roman Rite. Dr. Mark Spencer’s reflection on light in the Christian life could not have been a more apt continuation of the night. 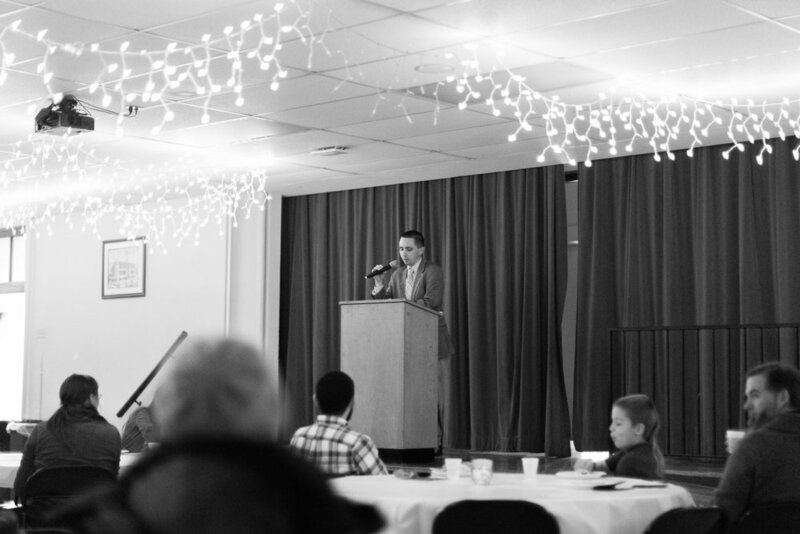 As a board member of Juventutem Twin Cities, one of the newest young adult ministries in the Twin Cities, it was a two-fold pleasure to be co-hosts with Roccasecca Project. Our two groups are both particularly supportive of the wider use of the Extraordinary Form (EF). To be able to help Roccasecca bring the EF to a group of people who may not be familiar or comfortable with its means of worship and praise is integral to the mission of Juventutem TC. Second, as a UST alum on a board of current students and alumni, it is also a wellspring of joy for us to be a part of the celebration of this beautiful liturgy to the community which nurtured our education. This Mass, and the procession it began with, are particularly well-suited to making clear to us that the Light came into the world. The blessing, distribution, and lighting of candles for the procession begin the liturgy. Fr. Bryan Pedersen, celebrant, received and blessed the candles to be used by the congregants in the procession and throughout the Mass. It is most fitting that the rest of us present approached the altar to receive our unlit candle and, in silence, blessed it with a kiss upon reception. That action of intimate benediction commended us by the Church in the prescriptions of the Rituale Romanum communicates to us and through us the joy we should have in receiving the Light that is Our Blessed Lord. Furthermore, the EF provided us the opportunity to physically orient ourselves toward the Lord in our worship. Practically speaking, in a darkened home in the wintery months we must move toward the lit rooms or sources of light to do anything after sunset. Naturally, then, we should logically be oriented toward the Lord, the Light of the World, in the celebration of the Mass. 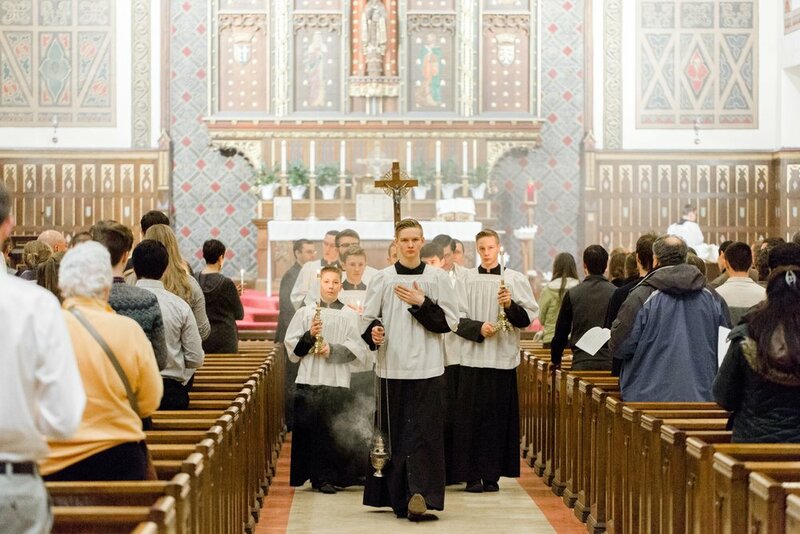 The Latin phrase ‘ad orientem’ is often used to describe this posture for the priest during the Mass and is derived from the fact that Our Blessed Lord, as the Light of the World, is expected in the east (orient) in His second coming, prefigured by the sun’s rising. Praised be God for these deep traditions in the Liturgy. After the Mass and some community time, Dr. Mark Spencer regaled the remaining crowd with a very enlightening reflection on how the light of Our Blessed Lord can and ought to permeate our lives as Christians. Dr. Spencer’s contribution as a philosopher provided us with a means to marry faith and reason in the events of the evening, particularly in his use of some of the philosophical thought of the Angelic Doctor and patron of the Roccasecca Project. To be a part of the evening, as participant and co-host, was a distinct joy. I left with a great deal of hope for the future of the University community and of the younger components of the Catholic community of the Archdiocese of St Paul and Minneapolis. If we young adults, St Thomas alumni, young families, intercessors can keep our whole selves oriented toward the Light of the World in prayer, worship, and daily work, then there is reason to rejoice. Listen to Dr. Mark Spencer's talk from the evening below.